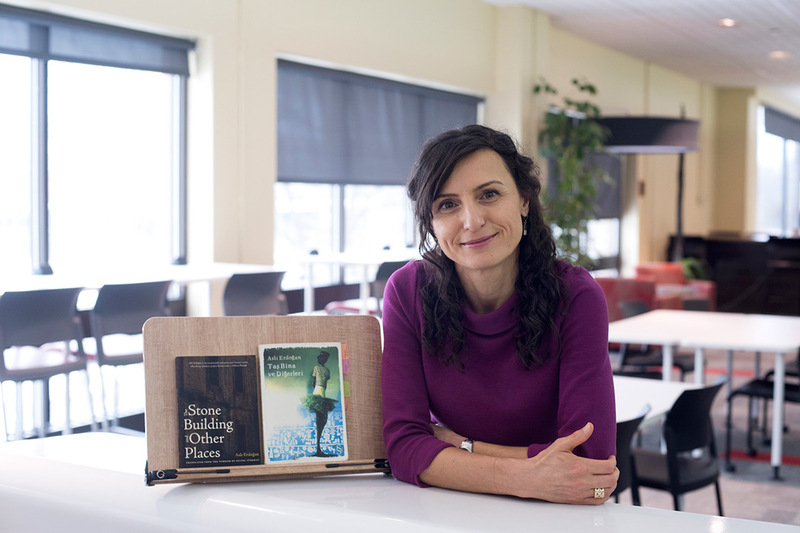 Sevinç Türkkan, an adjunct professor for Rochester Institute of Technology’s University Writing Program, is a finalist for a 2019 PEN America Literacy Award for translation of ’The Stone Building and Other Places,’ by Asli Erdogan, a journalist and human rights activist from Turkey. Translation technology may help if you need directions in a foreign country, but converting literature from one language to another is often a process that needs a human touch. Türkkan is a finalist for a 2019 PEN America Literacy Award with her translation of The Stone Building and Other Places, by Asli Erdogan, a journalist and human rights activist from Turkey. Türkkan will receive a $3,000 prize and travel to New York City where the winners will be announced later this month. The process became more complicated halfway through the translation when Erdogan was jailed for four months on charges she supported a terrorist organization. “She’s a very powerful writer, and what she wrote in the newspaper came across to the government as very critical,” Türkkan said. Erdogan now lives in exile in Germany and awaits a trial which, if found guilty, could send her to prison for decades. Türkkan decided to translate Erdogan’s book into English after “the text spoke to me. She’s a powerful writer.” But Türkkan said finding a publisher was challenging. Most books translated into English are from European languages, and mostly by male authors. After Erdogan was imprisoned, communication with her became impossible. Türkkan’s parents, who live in Turkey, asked Erdogan’s lawyer to ask permission for her book to be translated. The permission was given, written on a napkin. Erdogan was released pending trial, and in September visited Pittsburgh’s City of Asylum, an arts organization which provides sanctuary to endangered literary writers. Türkkan briefly met with ErdoÄŸan there, who expressed appreciation for the translation. This was Türkkan’s first book-length translation. Born in Bulgaria, she moved to Turkey when she was 12. She went to school in Germany and France before coming to the United States, and joined RIT in 2017. She’s grateful her translation work is being recognized because English is not her native tongue, and hopes her students – many who are learning English as a second language – become inspired to continue to study a new language. “It shows that one can actually do very well in a second or third language,” she said.